July 10th. 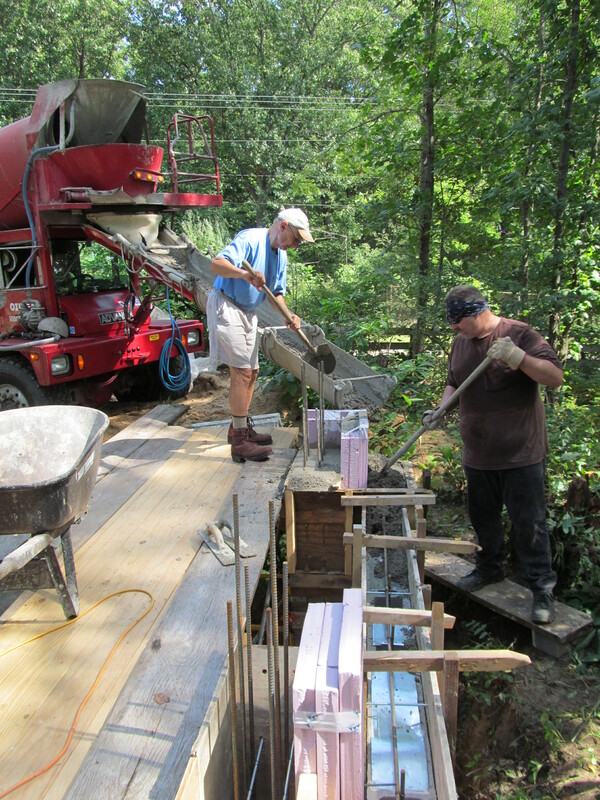 King posts are 5×5″ ash. 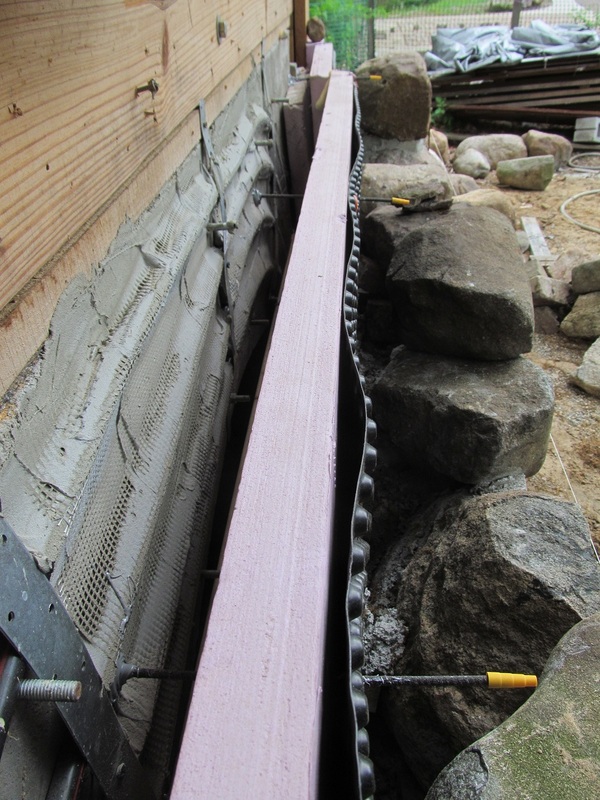 The ridge beam is around 19′ from where it bears on a wall that goes down to a footer and where it ends in the hip. It has a top chord of 2×12 and bottom chord is a 2×6″. The depth is close to 3′. 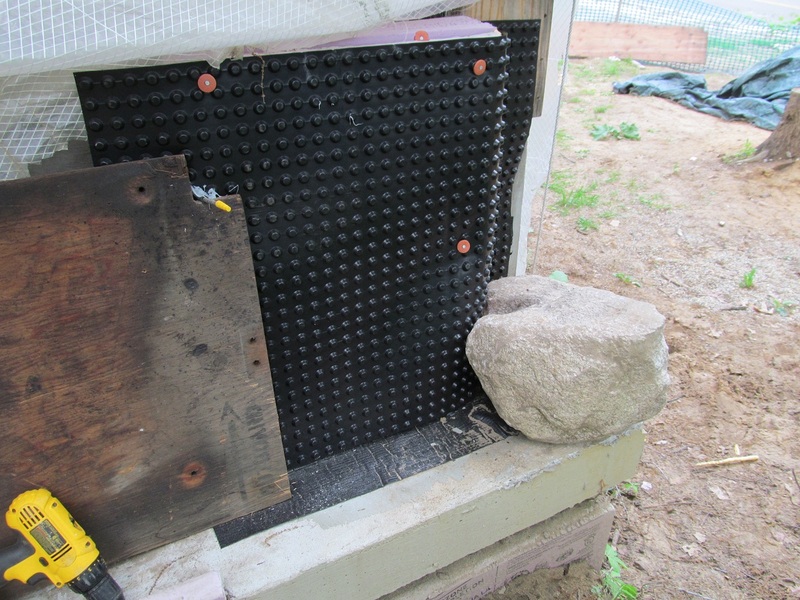 (This is above the 5×8″ ash ridge seen in the pictures below.) 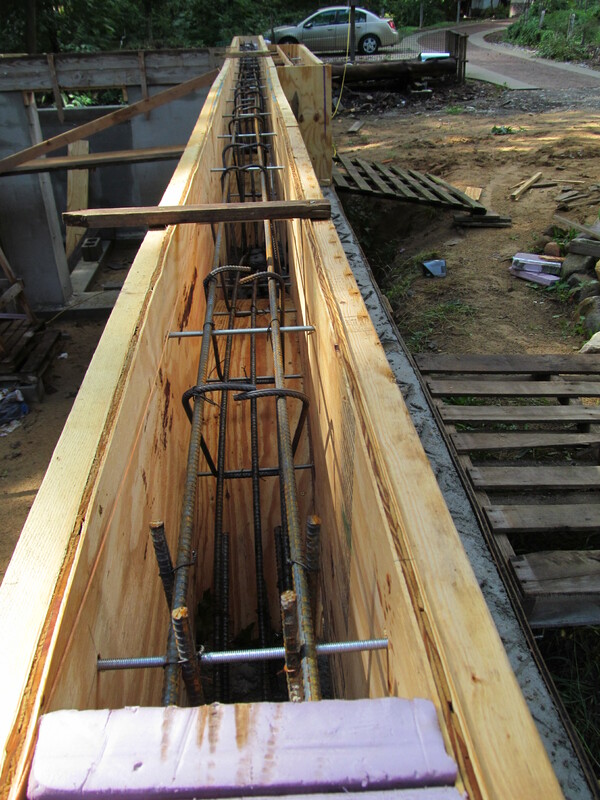 If my truss sections are not adequate as built, the ridge beam could be made load bearing by adding triangular members. 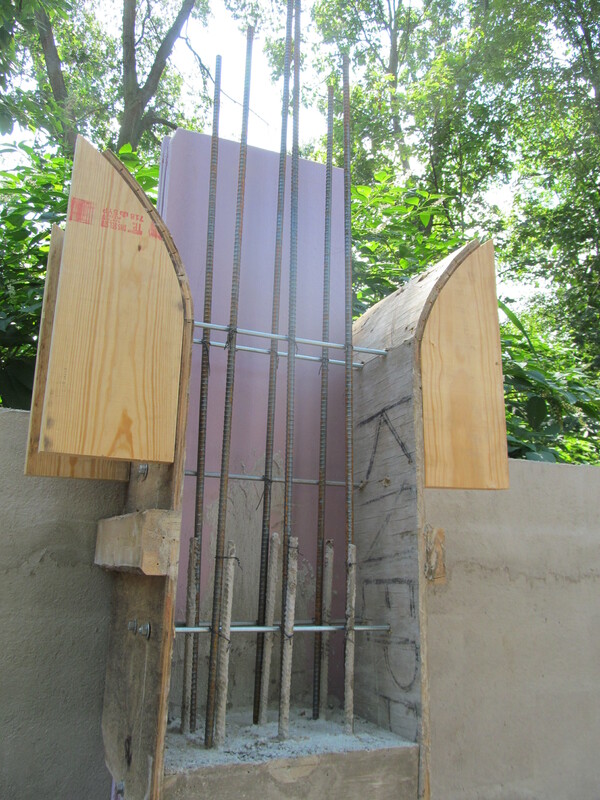 Update July 9th: Note to Keller Engineering: In the event that the truss sections need to be made stronger, I would prefer that reinforcement occur in the top part of the truss in the triangular wood section or in the form of a steel triangle brace under the main floor(braced against a concrete column in the basement) even if that brace needs to come down to around 5’6″ or 6′ at the column face. 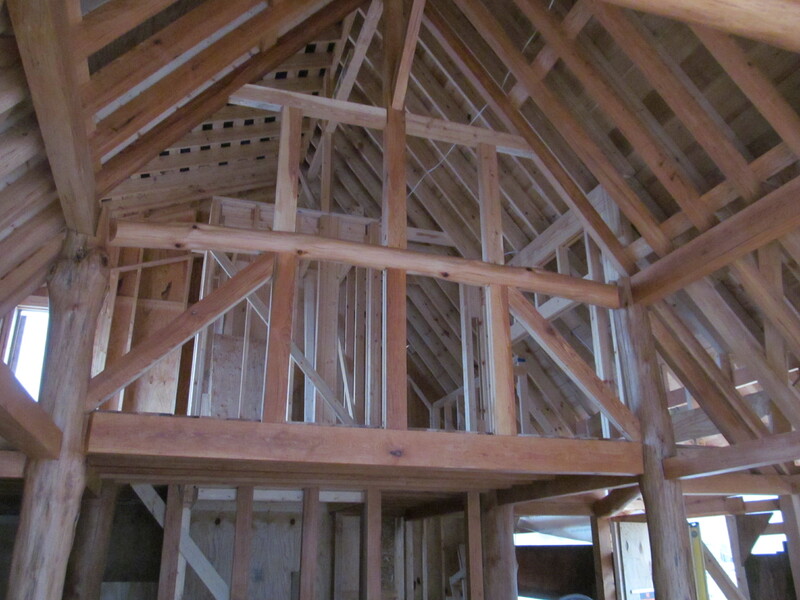 I would like to keep clear the rectangular areas above the existing steel truss sections for aesthetic reasons. 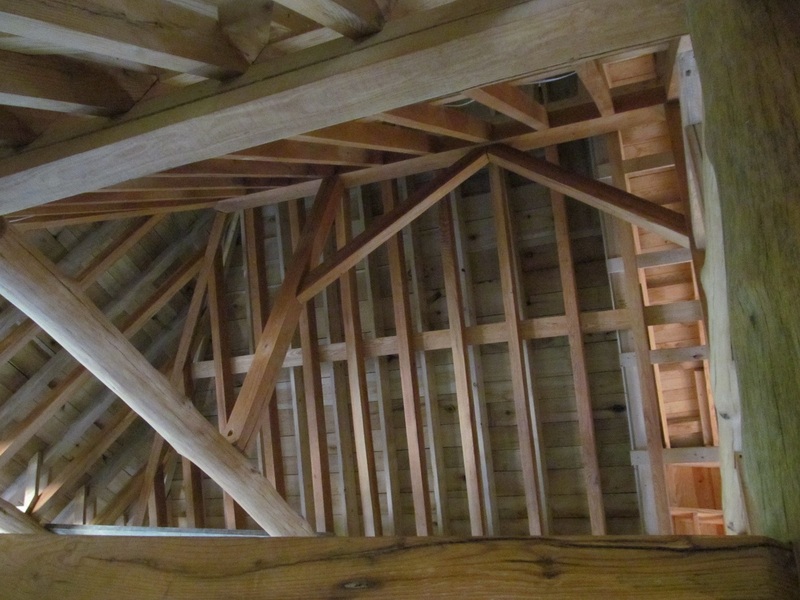 Also the angle brace at the top which is parallel to the rafter above it is a 3×5″. 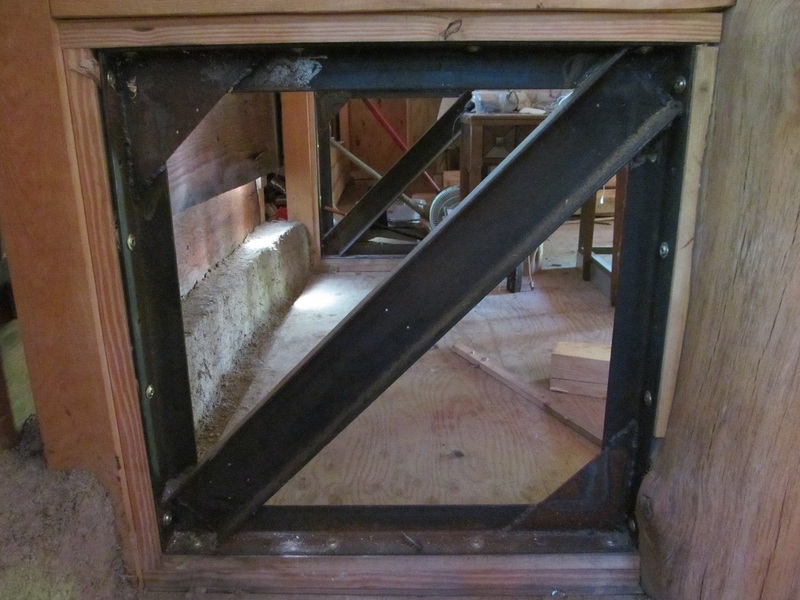 A steel section that I could weld up easily would be 1.5×1.5″ angle iron with plate steel filling in the triangular space. 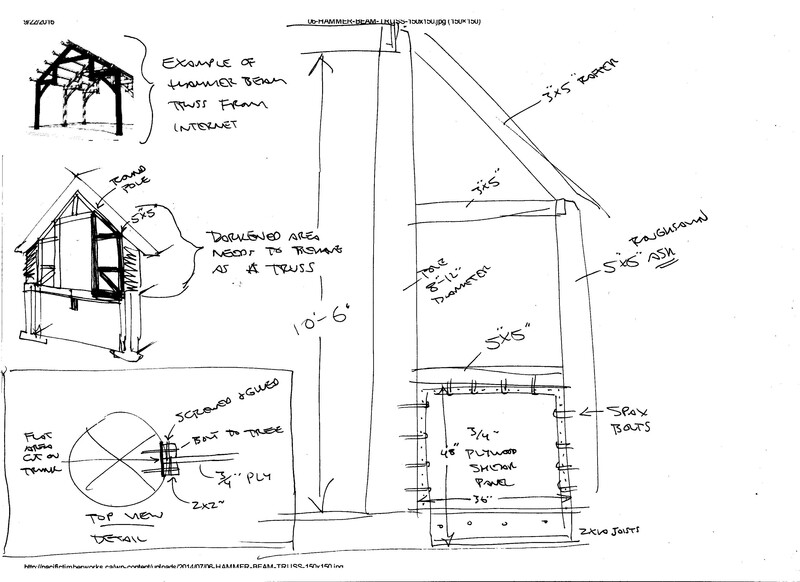 There would need to be a 2×2″ (actual 1.5×1.5″) nailer on all 3 sides of this triangular area to allow for drywall to cover the steel triangle. 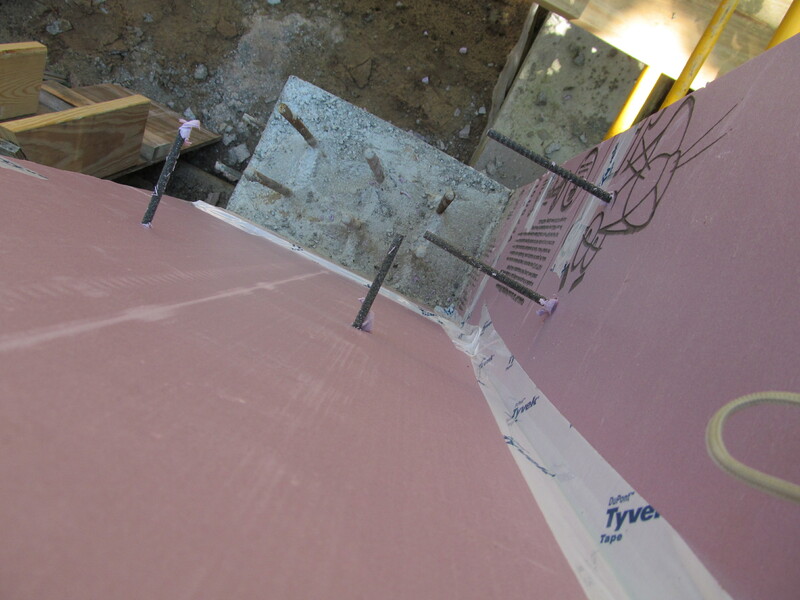 Beginning of cob cavity wall. 11″ thick outer leaf and 8″ thick inner leaf. 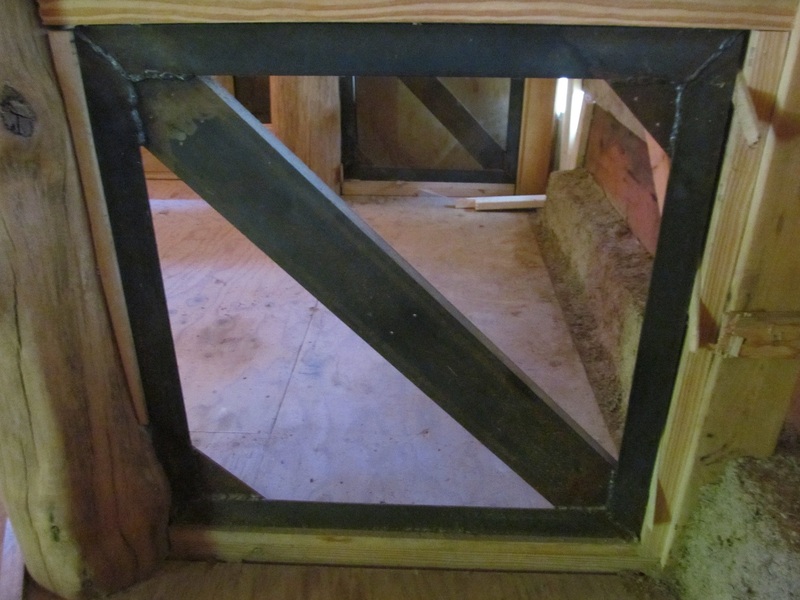 7″ cavity of 2 layers of 3.5″ R15 mineral wool. White oak and black locust 1/2″x 1 or 1.25″ ties connected with deck screws. 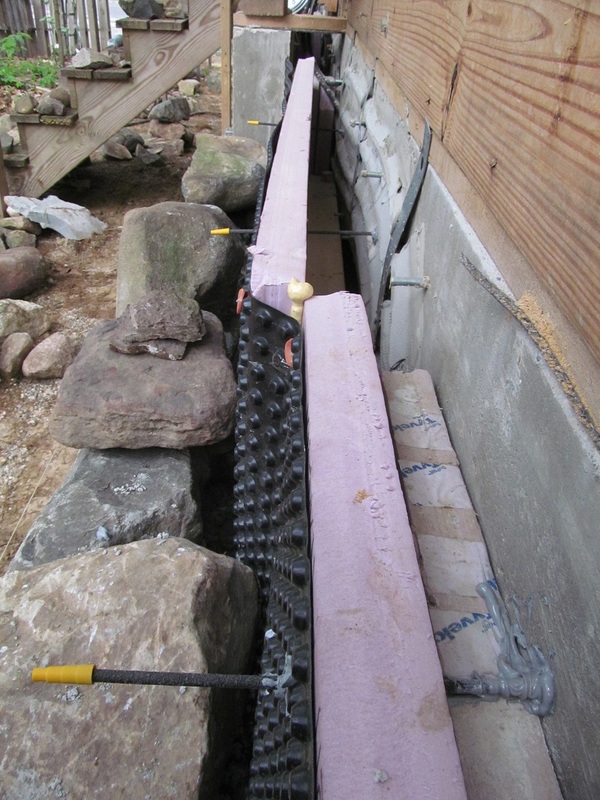 Above pictures show teplo ties connecting concrete arches to field stone stem wall. 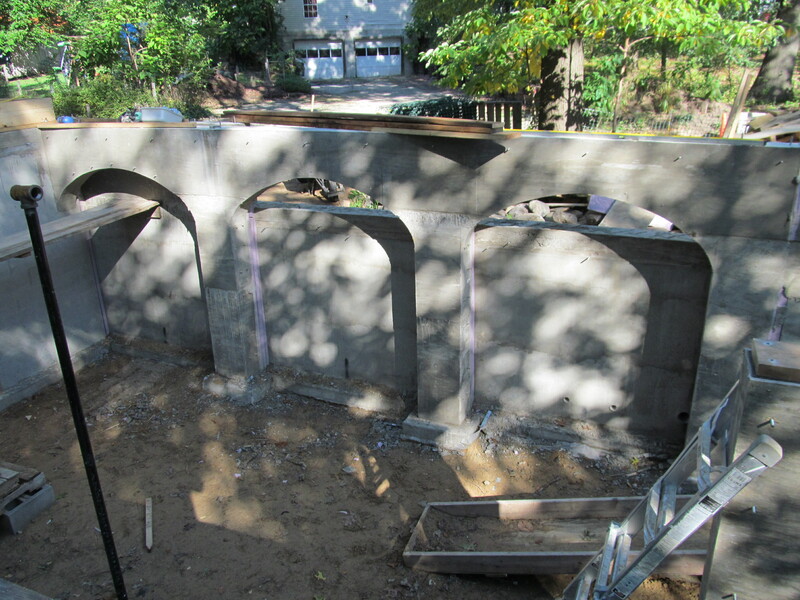 Also a small section of stem wall at the front porch is 8″ thick poured concrete with 2-3″ of veneer stone and showing wall ties in this area. 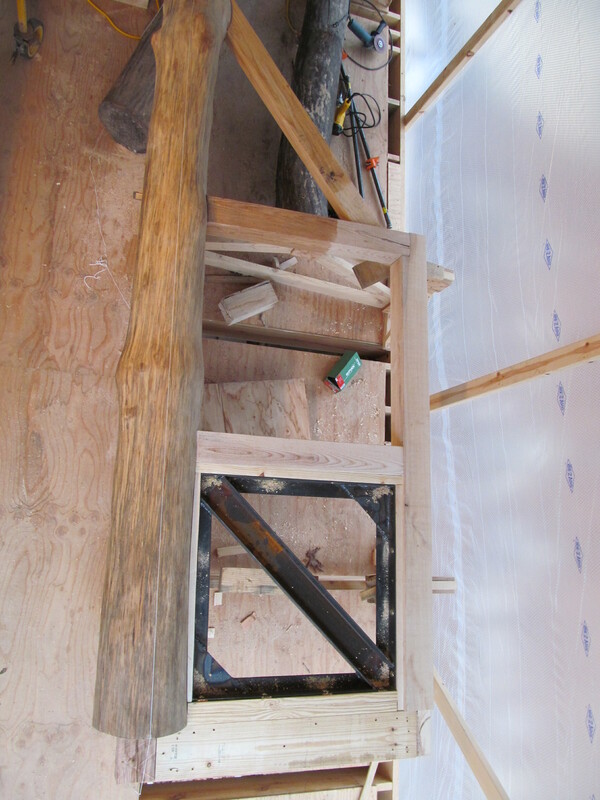 Floor of sleeping space in loft is 3×5″ roughsawn ash with spacing of 14.5″-15″ o.c. with span of 11′-1″. 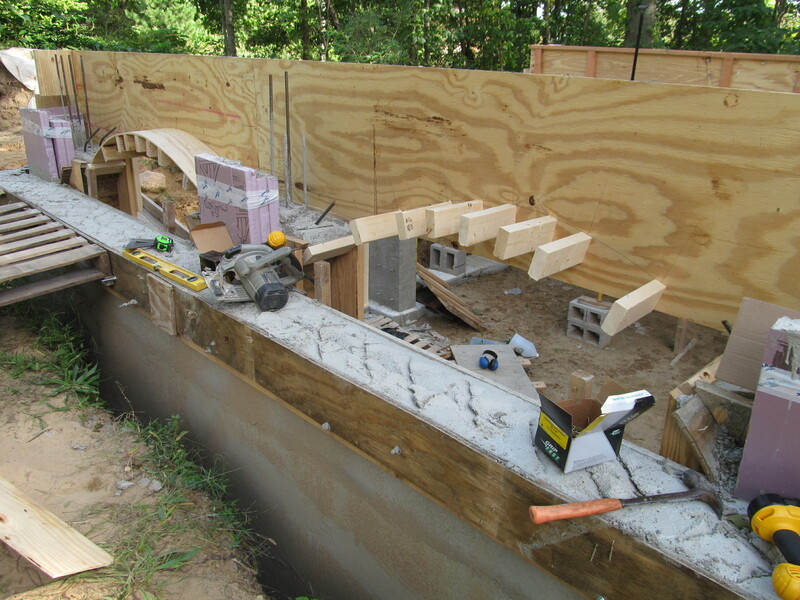 Edge beam pictured is 5×8″ ash. Ash rafters are 3×5″ 15″ o.c. 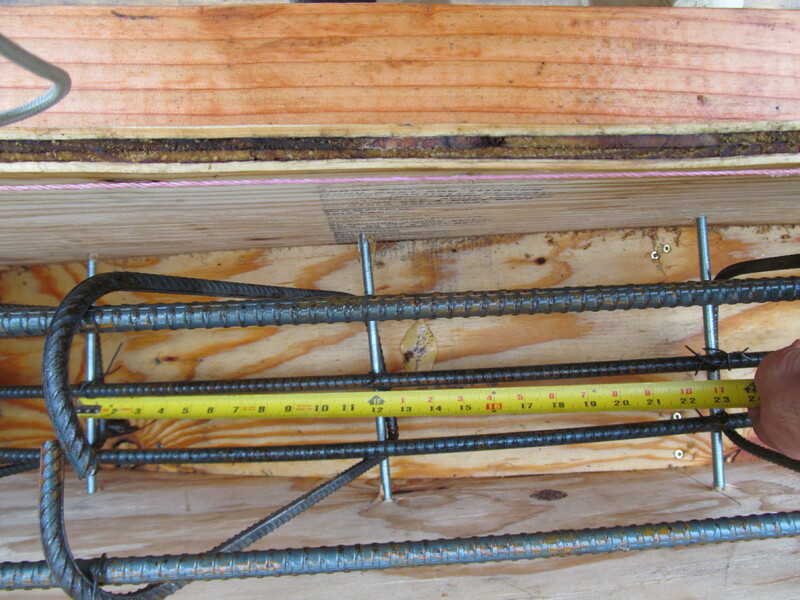 ash fastened with 1/4″ SPAX bolts: tensile strength 1169#, shear 766#, (southern pine) withdrawal 279#/inch and head pull-through 69#. 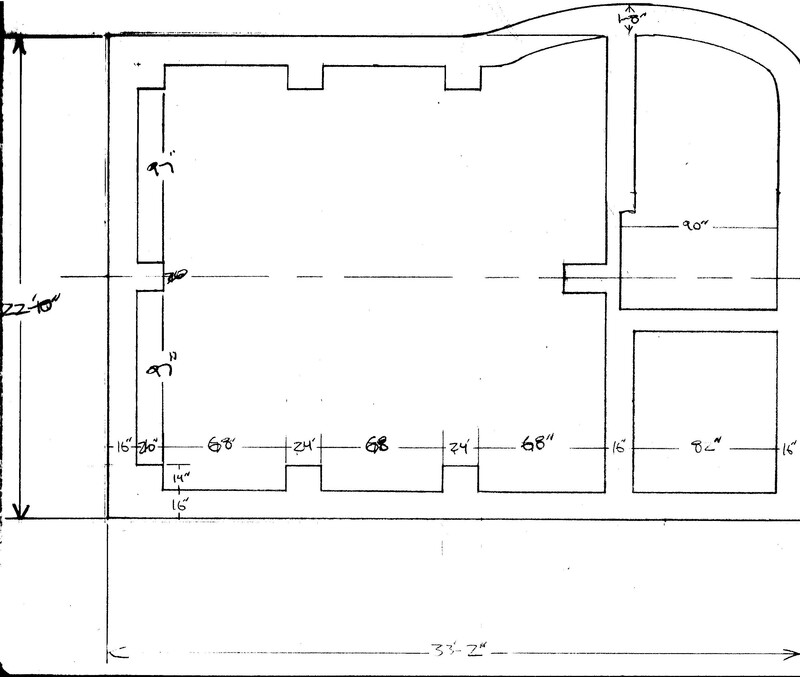 Floor of main room: #1 2×12’s 16″ o.c. 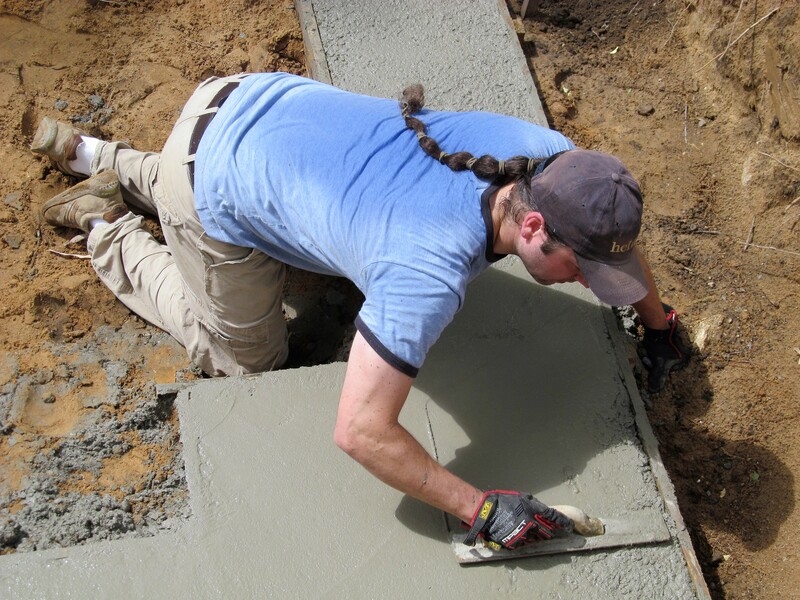 southernpine.com says 19′-1″ with 40# live and 10# dead loads and I’m only going 18′-6″. The house is a three aisled hall house. 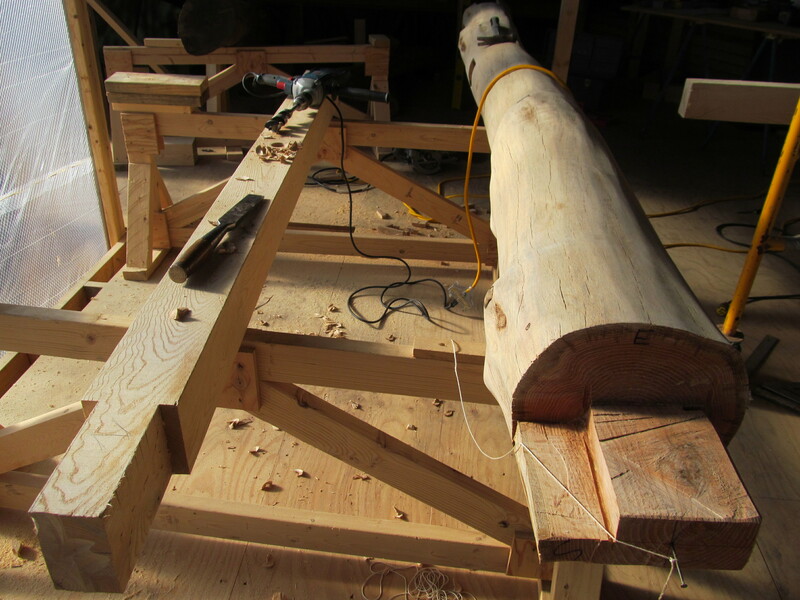 The tree trunks act as columns to order the space into bays and will weigh around 300# (10″ diameter, 12′ long oak at 45#’s/cu ft = 300#’s) I built big trusses from the tree trunks and 3×5 and 5×5 ash and welded up a steel brace from angle iron and channel. This is bolted on all 4 sides to the wood with four 3/8″ Spax screws (tensile strength 2402#, shear 1435#, southern pine withdrawal 361#/inch, southern pine head pull-through 787#.) 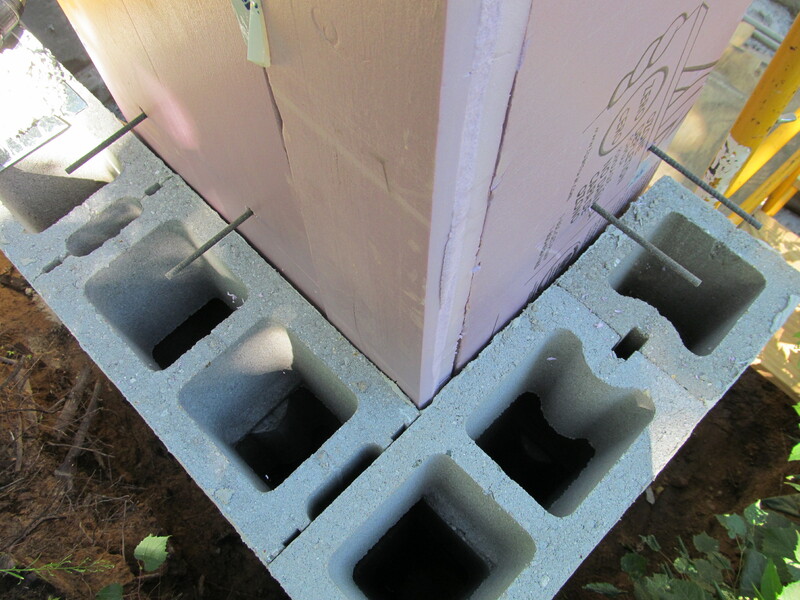 Corner bolts are 1.5-2.5″ from corners and the rest spaced evenly. 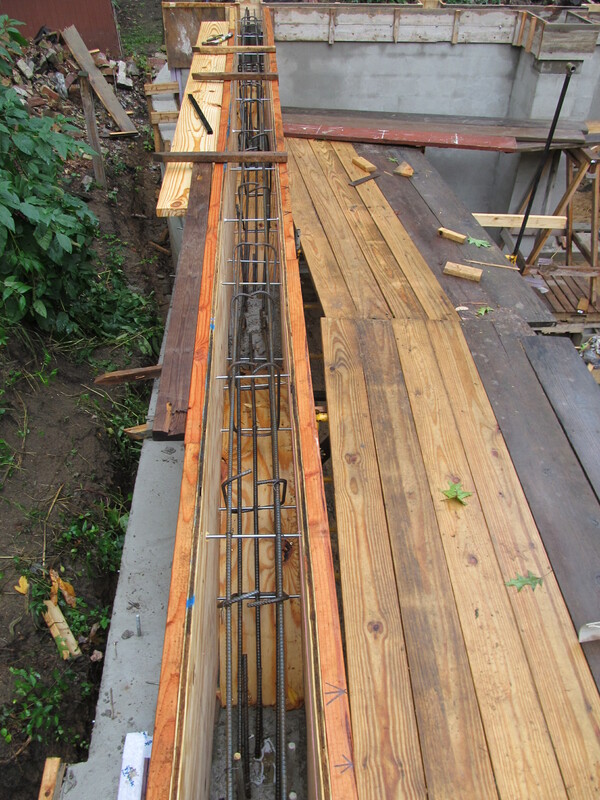 The steel truss sections are 33×33″ and are made of 3/16″ steel. 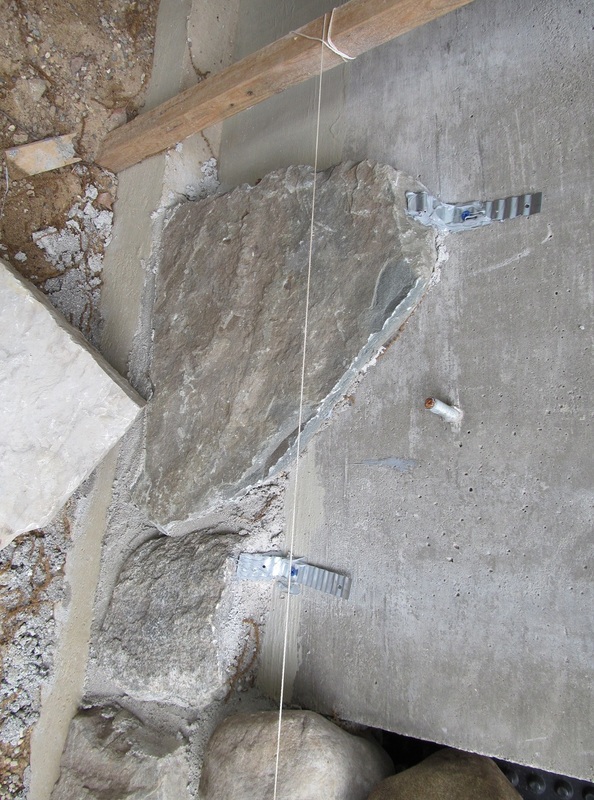 Angles are 2.5×2.5″, fillets are triangles hypotenuse=12″, brace is 1.75×5″ channel. Welded both sides. 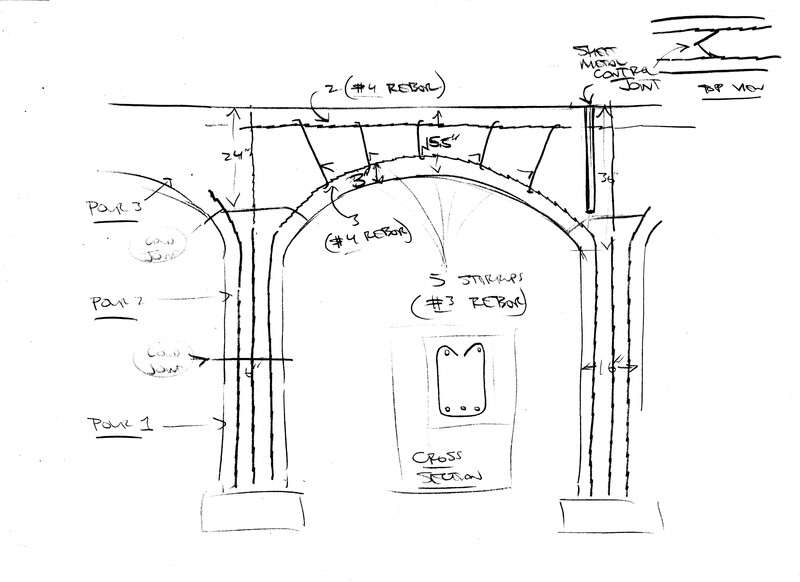 Arched beams are 9.25″ in width. 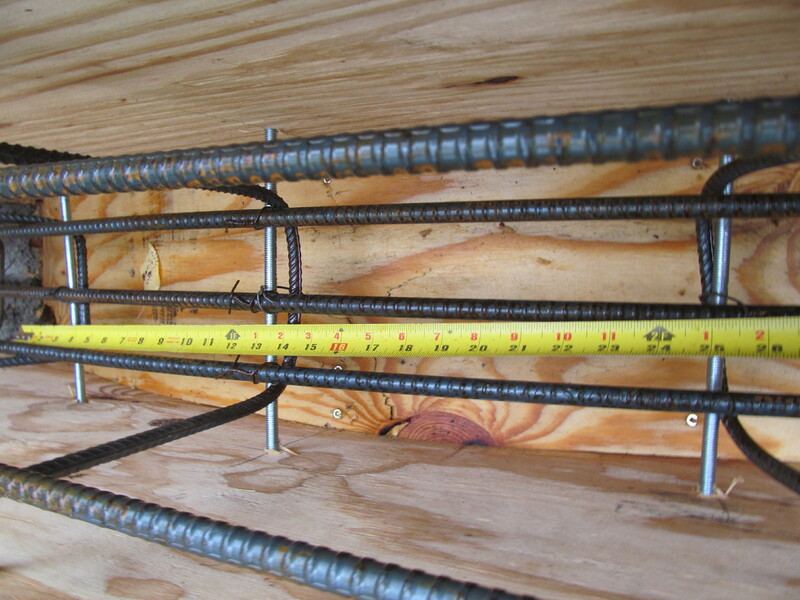 Start at 36″ in depth and at thinnest point (top of arch are 15.5″) with 3 #4 rebar at bottom (3″ up) for an effective depth of 12″. 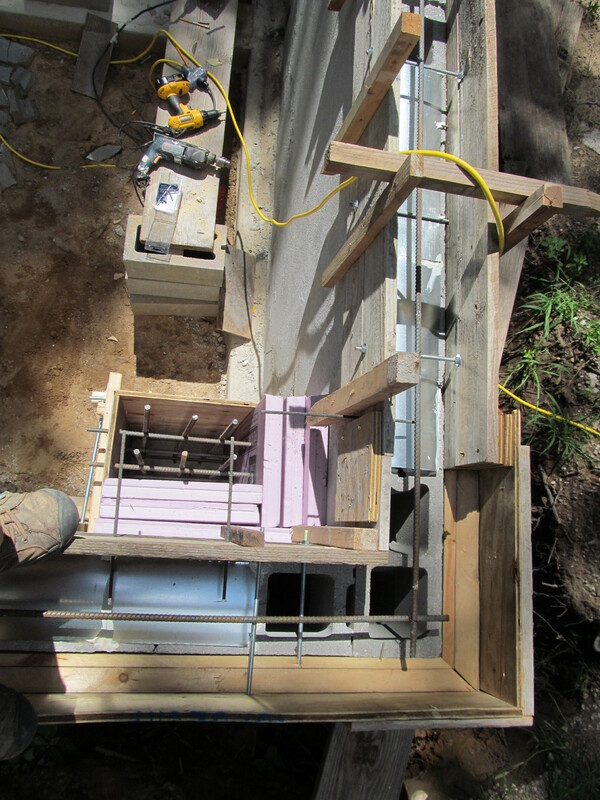 Top of beam have 2 #4 rebar 3″ from top of beam. 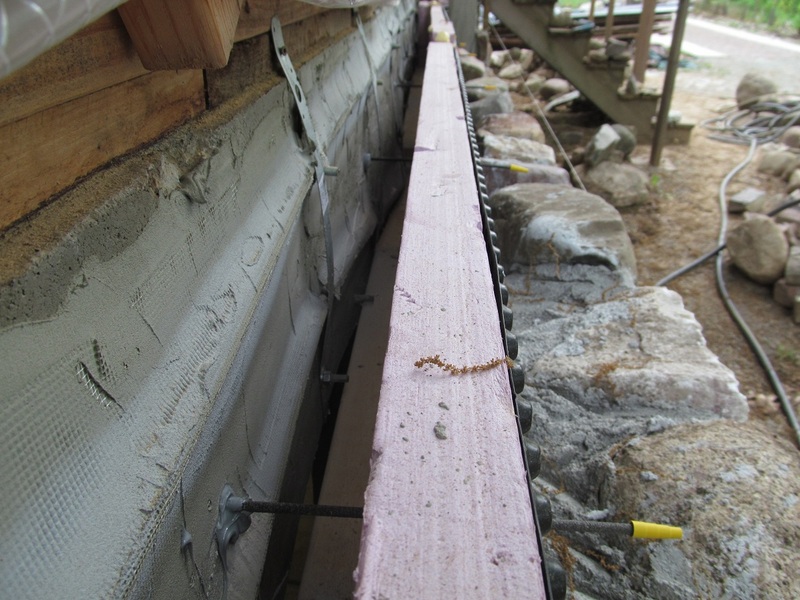 The posts support the post and beam frame, the beams only support floor joists for the living areas (40# live weight and 20# dead weight) and cob wall 8′ tall at +-100#’s/cu ft. 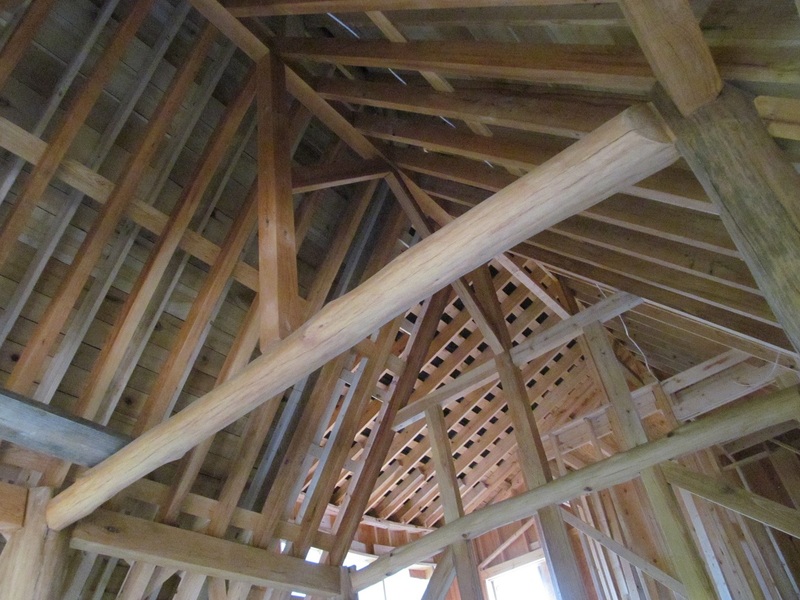 The beams do not carry any roof loads. 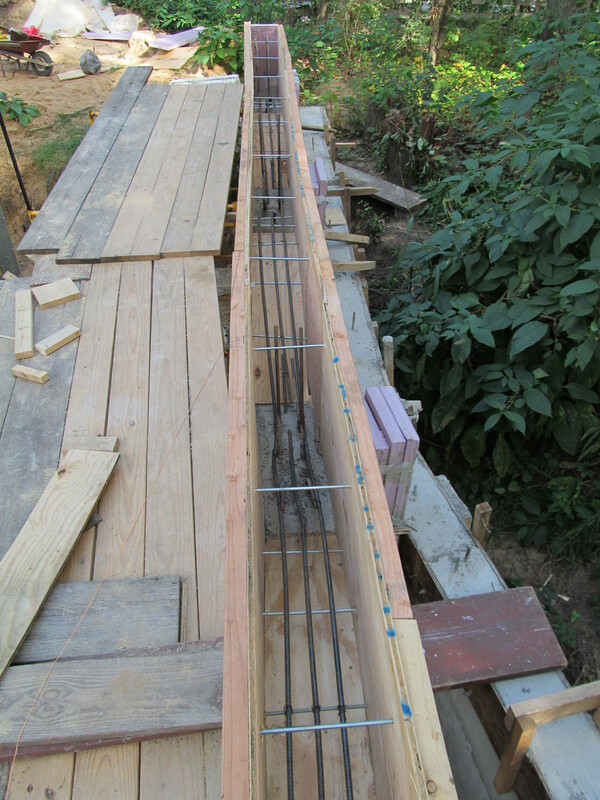 I made stirrups from #3 rebar and will have 5 approximately equidistant along the span. 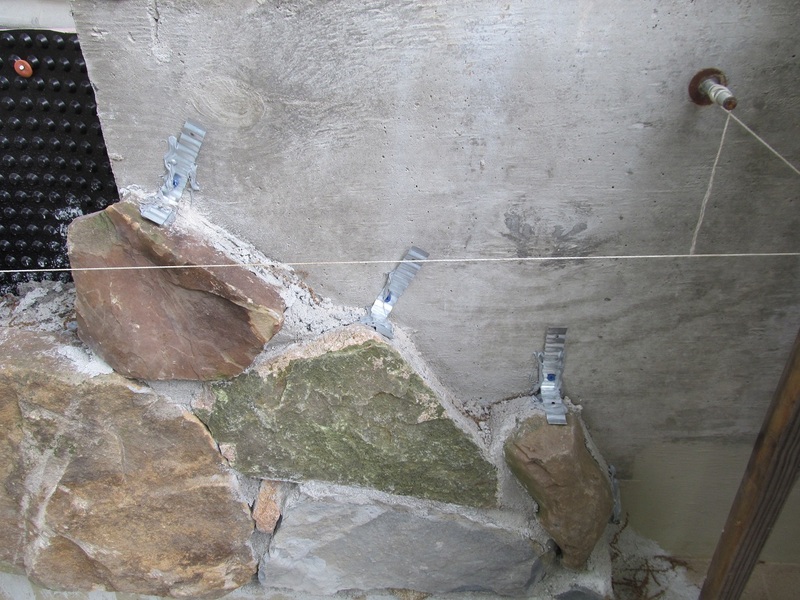 Control joints are made with sheet metal placed to weaken an area of beam (along with cutting relief cut with concrete saw in line with sheet metal) which is over the column. From the top the sheet metal makes a “V” shape to make a key. See diagram below. 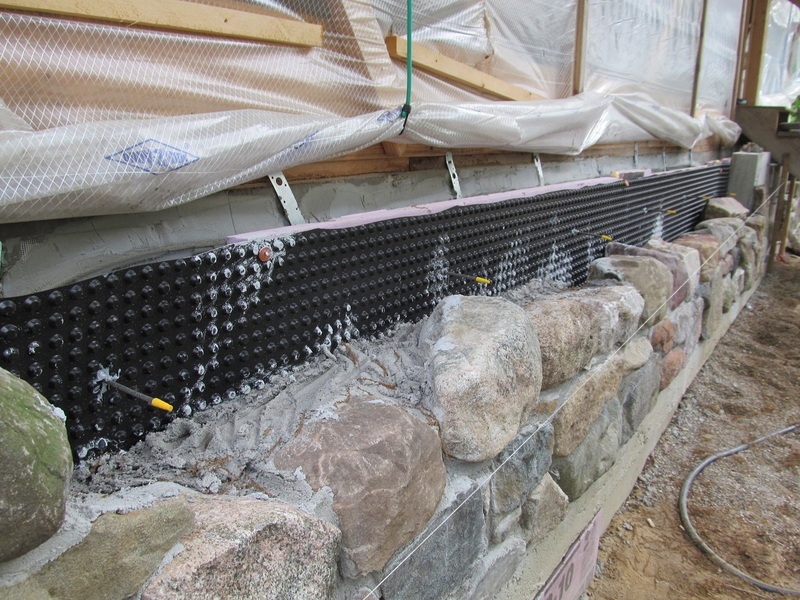 Outer wall is 8″ CMU dry laid with Quikcrete Quikwall surface bonding cement (first row on footer in mortar bed). 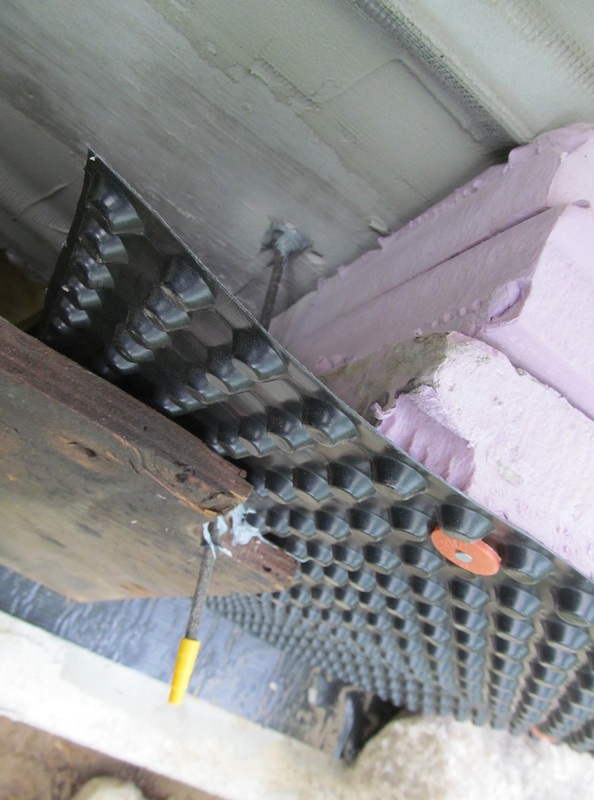 1/2″x12″ J-hook at corners of footer (3 cores reinforced per corner) and every 4′ with same cores filled and #4 rebar in. 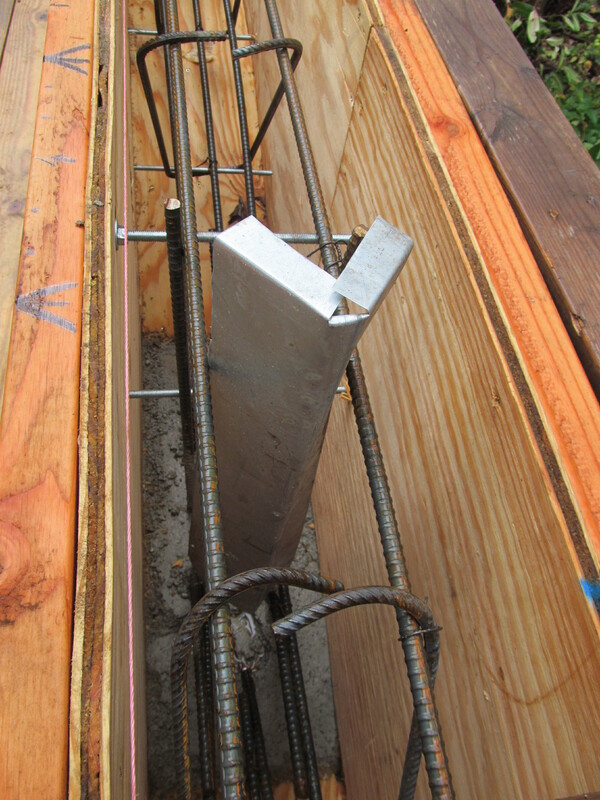 Capped with 8″ bond beam with 1 #4 rebar. 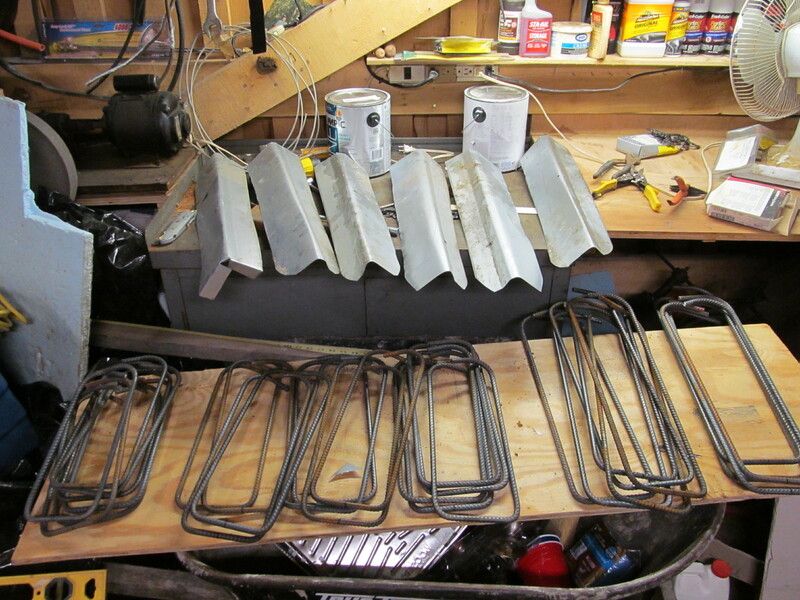 Here are my stirrups and metal plates to make control joints. 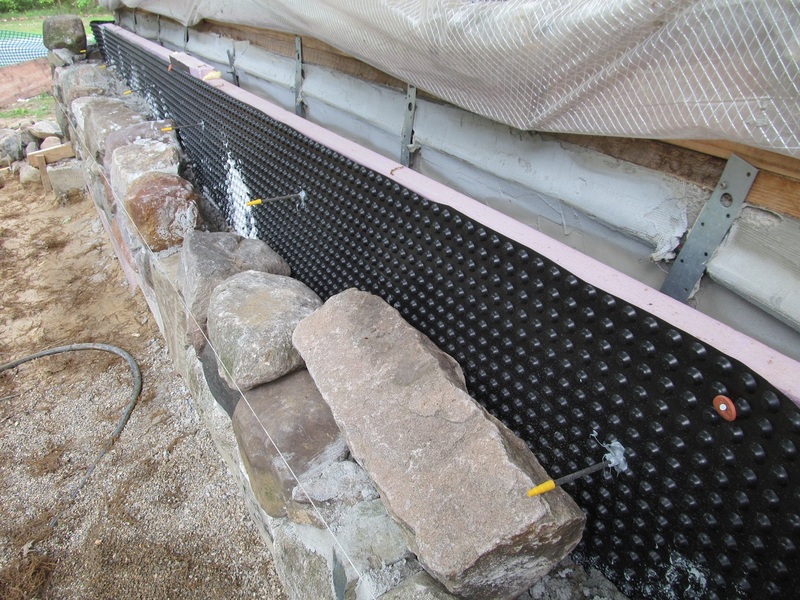 Columns are anchored to outer wall bond beam with 6 mm x 13″ Teplo ties (masonry ties made from extruded basalt embedded with sand with 1/20th the thermal conductivity of steel to eliminate thermal bridging) 4 at corners and 2 from each column to wall. 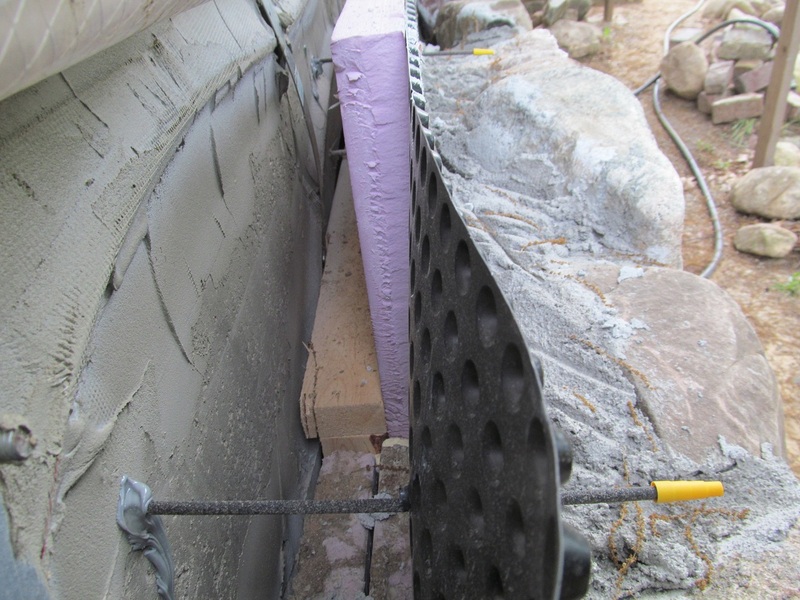 Also columns are poured with 2 or 3 sided forms so the weight of the wet concrete during pour is squeezing against the 4-6″ of extruded polystyrene (“250” high compression board) so essentially wall and column are braced against each other. 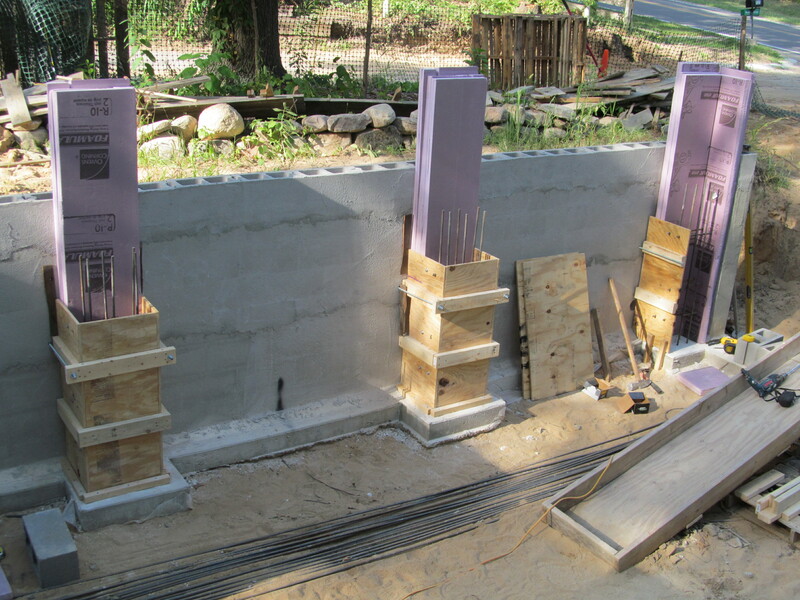 Concrete columns 9.25″x16″ anchored to footer with 2 12″ J-hooks. 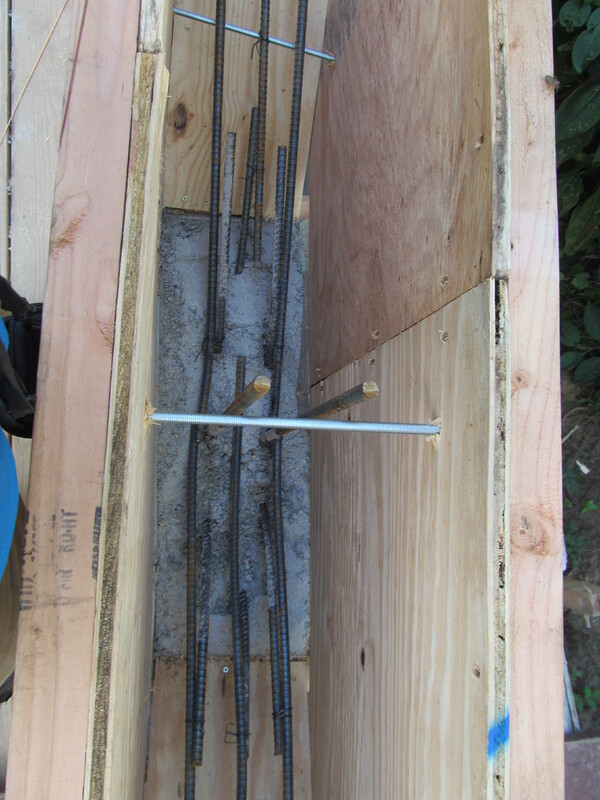 6 #4 rebar placed in column. 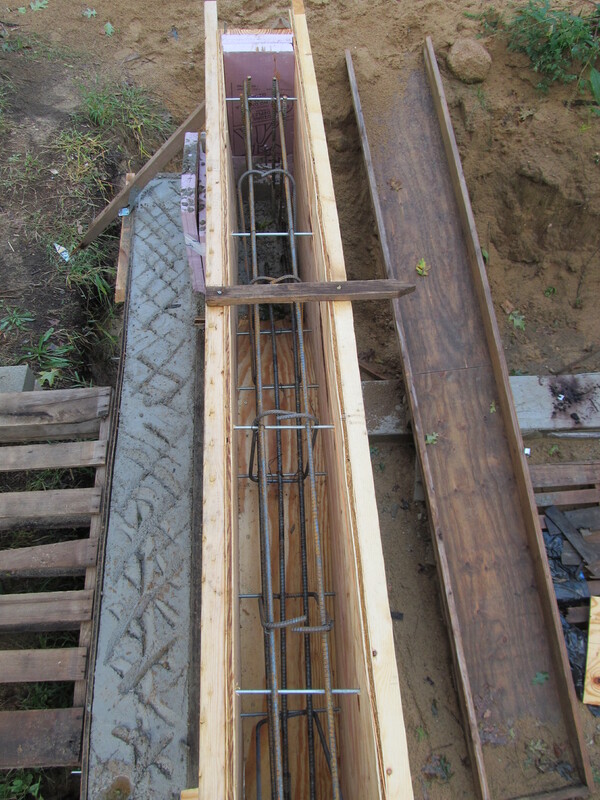 12″ overlap of rebar between bottom and top half of column. 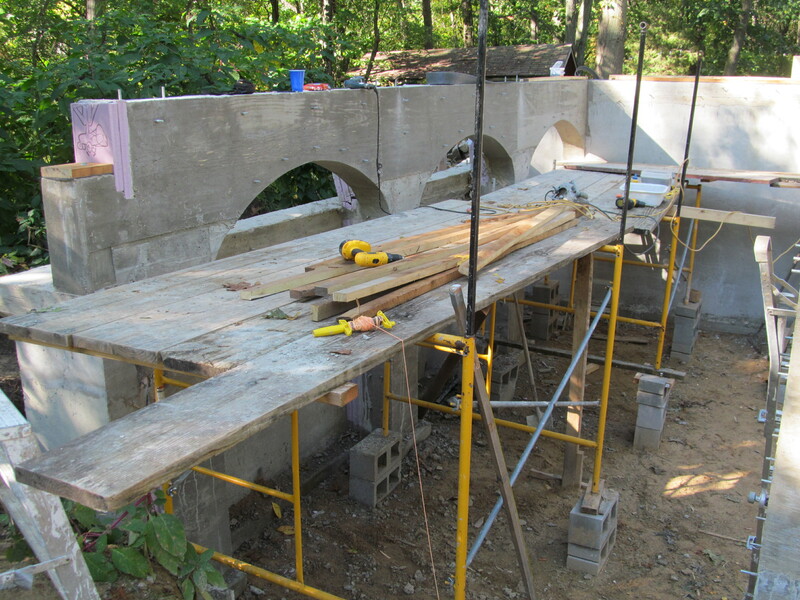 Clear span of beam is 75″ or less. 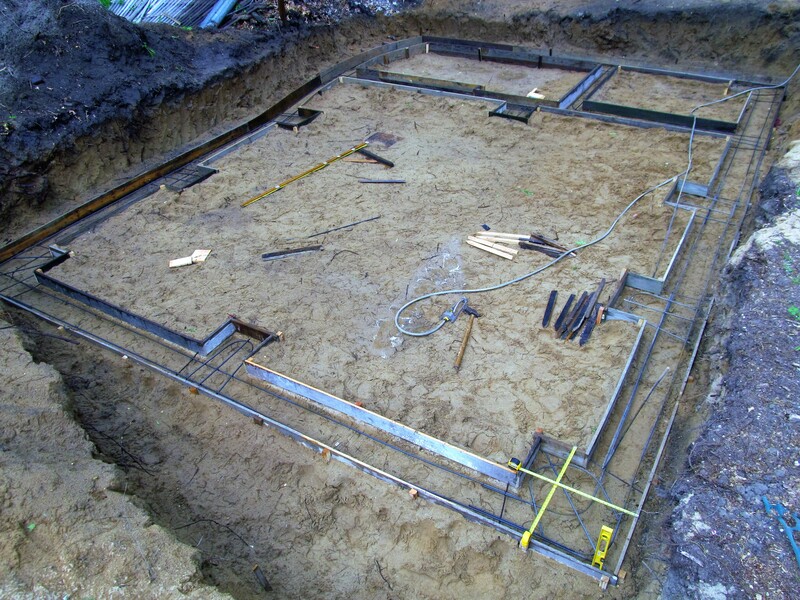 Footer plan: 8″ deep of 4000 psi gravel mix concrete (all concrete used in house is 4000 psi) with 2 #4 rebar placed 1/3 of the way up from bottom. 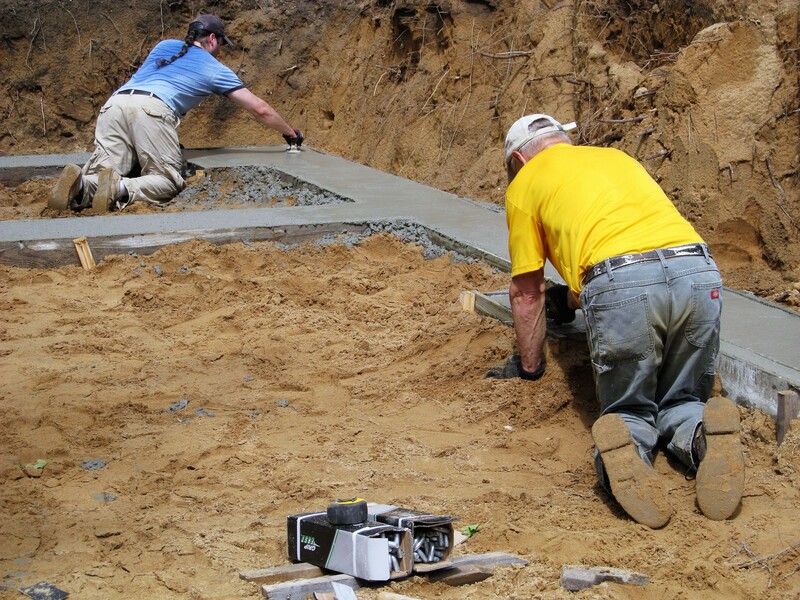 Subsoil is 100% fine sand.